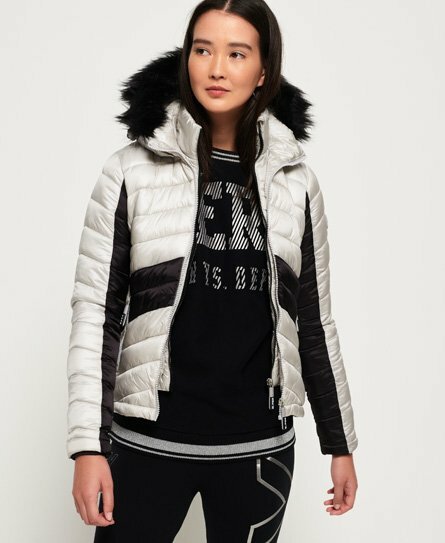 Superdry women's Offshore luxe chevron Fuji jacket. This iconic Fuji jacket is a slim fitting quilted jacket featuring a double layer zip fastening. The hood has a faux-fur trim and a bungee cord adjuster. The Offshore luxe chevron Fuji jacket also has elasticated side panels for added comfort and two external zipped pockets for practicality. The jacket is finished with a Superdry logo badge on the left sleeve and colour blocked panels on the sleeves and back.